Rheology is defined as the science of the deformation and flow of matter, which means that rheology in some form enters almost every study of material properties. In the Nordic countries, rheological measurements have become standard techniques in both industrial and academic research. 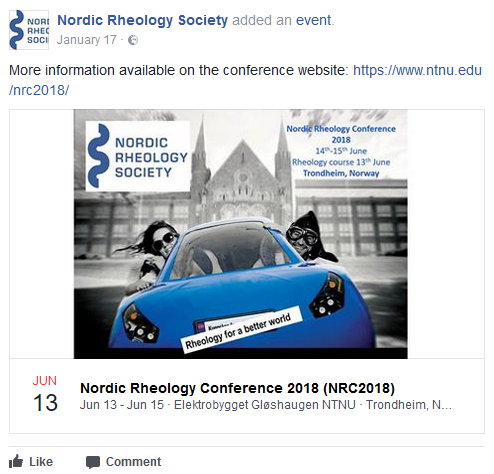 The Nordic Rheology Society has been formed as a meeting ground for engineers, physicists, chemists and biologists engaged in rheology in industry and academia. A connection to NRS news flow on Facebook will be presented here soon. Why is complex viscosity called complex viscosity ? Submit your abstract to the NRC! 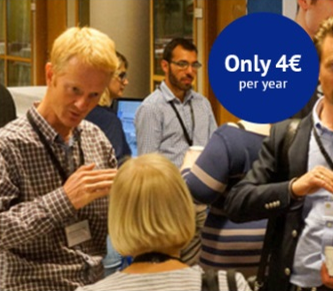 The Nordic Rheology Conference will be held in Gothenburg August 21-23. The program includes a mixture of plenary lectures by internationally renowned invited lecturers and contributions from NRC delegates, and it is now time to submit abstracts for your presentations, posters as well as lectures. Authors should submit a clear and concise description of the contribution as a PDF file, no more than a half A4 in length, to abstractnrc2019@chalmers.se with the subject line ‘NRC2019-abstract’ before April 26. More information is found on the NRC web page. Jan Vermant is a leading scientist in colloid and interfacial dynamics. His work includes important findings on dispersion rheology and he is recognized for his innovative and foundational contributions to interfacial rheology. Similar to the symbolics of the plant depicted in the award statue, he inspires students and colleagues to grow and develop. In the photo ESR President Peter Fischer (left) hands over the delicate statue to Jan Vermant (center), overseen by Gerald Fuller (right). Read more about the award and his work on the ESR web and on his research group's page. The Weissenberg award is the finest rheology award in Europe. It is handed out every year of the Annual European Rheology Conference. Nominations by ESR members are handled by the Award Committee and the awardee receives the award statue at the AERC. The award statue is designed by the Swedish designer Maria Olofsson in glass to capture the feeling of a frozen flow. The interior drop of blue glass represents the source of knowledge. The climbing plant and the leaves shows the symbolizes the strive for new knowledge and the persistence of the awardee. Finally, the gold color symbolizes victory and glory. Paula Moldenaers has led the Laboratory of Applied Rheology and Polymer Processing which is one of the leading rheology centres in Europe, at the Katholieke Universiteit Leuven. She has studied the morphology of complex fluids such as immiscible blends, liquid crystals, filled systems as well as gels, and she is a leading rheologis in the polymer area. She has published over 120 international journal papers and lectured for numerous students at courses and conferences.